He immigrated to this country with his family, when he was almost 4 years old. The family crossed at Prescott, Ontario to Ogdensburg by way of the very huge ferry, the Joseph Dubrule. They brought some horses and horse drawn equipment to start their new life on this side. The family eventually settled on a farm on the Black Lake Road. 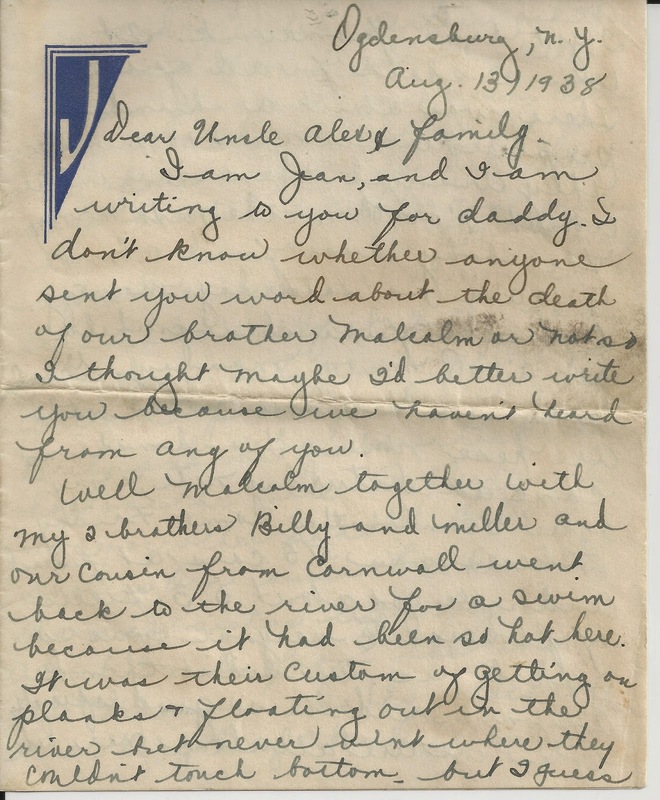 Below is copied the text of an almost 77 year old letter that was written to my grandparents Alexander and Mary Simms telling of the tragic death of their nephew Malcolm in the Oswegatchie River just over the Canada-US border south of Ottawa on August 6, 1938. I am Jean and I am writing to you for daddy. I don't know whether anyone sent you word about the death of our brother Malcolm or not and I thought maybe I'd better write you because we hadn't heard from any of you. Well Malcolm together with my 2 brothers Billy and Miller and our cousin from Cornwall went back to the river for a swim because it had been so hot here. It was their custom of getting on planks & floating out in the river but never went where they couldn't touch bottom but I guess they had floated farther out than they intended to. So they all got off their planks & went down. Miller said to Malcolm watch out for the hole and as he did, Malcolm says here it is & was gone. Miller had gotten into the hole himself but some way or other he scrambled out of it. Billy had gone down 2 times & Miller had gotten a pole & pushed it out for Billy and he grabbed the death hold on the pole. Miller some way or other paddled Billy to shore. Our cousin Lee Russell, mamas sisters little boy ran about 3 miles from the river to tell Mamma & Daddy. I didn't know anything about it until I got home from work. It was a shock for all of us. There was about a hundred people here in about 10 minutes. They dragged the river until about 2:00 am the next morning. The body was found about 9:10 am on Saturday morning and the funeral was held at 2:00 pm on Monday. Grandma Simms and Grandma Miller both are here now. Grandma Sims (sic) came on Saturday nite & my other Grandmother came Friday. There was 75 cars at funeral and we got about 53 pieces of flowers. Everyone was so good to us. We didn't think anyone could be so good especially when we are all alone over here and all our relatives over in Canada. But no one ever knows his friends until something like this happens but we hope he is happy where he is because he was a good boy &had no sins. We have cut a piece out of the paper to send you and I will copy some thank you cards off for you. Well there is 4 of us left. Miller is 15 and Billy (Jr) is 12, and Edna is 10 and I'm 19. Daddy wonders why you don't write, he gets lonesome often and it will be worse now because Malcolm was always around with him. How is everyone in your family and how many children have you. It seems terrible that you have people so far away and don't see them and don't know what they look like. Did you get any of that hail storm? Grandma said to send her love to you all. She is quite thin now. Daddy is quite thin also. Have you any children as old as I am? Well please answer this and tell us how you all are and Daddy will be expecting a letter from you. The boy attended country school near his home and was a great friend to all who knew him. He was recognized as a good student and would have entered eight grade in September. Malcolm was buried in the nearby Pine Hills Cemetery on Eel Weir Road. I can only imagine the grief and guilt this family carried with them for the rest of their lives. Thanks for posting. "Billy" Simms was my dad. We always knew he had a brother who drowned but he never talked about it so we never knew the details. So surprised to see this letter from Jean - how interesting!